Is There a Preferred RAW Converter? Does the Lens Mount Matter? Who Wins The Mirrorless Wars? In Retrospect, What Did Sony Get Right and Wrong? What Were Nikon Users Looking For? Is m4/3 Still a Viable Choice? The "Bests" and the "Worsts"
What Do Fujifilm's Dynamic Range 200%, 400% Mean? What's the best mirrorless camera if I do a lot of video work? What's this hacked Panasonic firmware I hear about? Isn't the sensor too exposed when changing lenses? Will I ever need to manually clean the sensor? Which m4/3 maker should I go with, Panasonic or Olympus? How is m4/3 different than 4/3? Who makes the Nikon 1 sensors? Who makes the sensors for NX cameras? Who makes the sensors for Sony cameras? Do the Sony models really overheat? How do I avoid producing condensation when moving indoors and out? Should I be worried about the Olympus management scandals? Can you explain the crop factor thing? Can I use my existing lenses with a mirrorless camera? What lenses can I use with the adapter on the Nikon 1? Panasonic m4/3 100-300mm or 100-400mm versus big camera and lens? Is there a tripod mount for the Panasonic 100-300mm? Can I Use Panasonic Lenses on Olympus Bodies? What the heck is "rattlesnaking" on m4/3 lenses? What's the Difference between the Olympus 14-42mm Lenses? What About Third Party Lens Support? Are your books just rewrites of the manual? Why can't I find your works in the Kindle (Nook, Apple, Android) store? Help keep this site going. Click on the button above for details. The introduction of the Canon RP introduces a new element into the full frame versus crop war that's been going on. I've noted before that with very capable 24mp full frame bodies on the market from Nikon and Sony at the US$2000 price point, Fujifilm was forced to push the pricing of their crop sensor X-T3 down a bit in order to provide marketing space. Now, with Canon busting the full frame entry point all the way down to US$1300, we now have a series of crop sensor mirrorless cameras that are above the full frame entry price point. Something's going to give. What's most telling in Canon's RP pricing is that it's basically the same camera as a Canon 6Dm2 DSLR, a camera that lists for US$1799 (though it's on sale at the moment for US$1499). There's no real price skimming in the RP. Or, if there is price skimming in the RP, then full frame is going to push under US$1000 very rapidly, which would seem like death by profit seppuku in a contracting market. Sony just escapes with the A6500. Other than the two GH5's—which most buy for video purposes—it's difficult to make a strong case for some of the others. In essence, a crop sensor mirrorless camera selling for more than US$1000 now is going to have to be marketed as the low-cost version of the pro full frame cameras (e.g. the D500 versus D5 positioning). Put another way, to sell at more than US$1200 a crop sensor camera is going to have to be able to claim "everything in the top cameras available, but with a smaller sensor, using smaller lenses." People jumped on me about how harsh I was with Olympus E-M1X announcement. Now you have a good idea of why. While the E-M1X can claim to have "everything in the top cameras available, but with a smaller sensor, using smaller lenses," it unfortunately is up in the high-end full frame price point, not just above the full frame entry price point. Plus the oversized body loses some of the "small" advantage. It isn't a coincidence that the top EOS M crop camera is now selling for US$799 with a lens. Canon themselves are as vulnerable to the full frame entry price point as the others, but they've placed their APS-C lineup far enough away from the RP that they should be able to still pick up the price sensitive user. Fujifilm — Fujifilm is in a tough position with their APS-C product. The X-T3 may manage to live above the full frame price bar, but it's going to need constant attention and performance enhancements to stay there. But all across Fujifilm's X lineup there's now going to be increased downward pricing pressure. Nikon — Nikon doesn't have a crop sensor mirrorless product. There are some that say they never will, particularly now with Canon's announcement. Frankly, I think Nikon caught wind of Canon's intentions here, or at least feared it might happen. 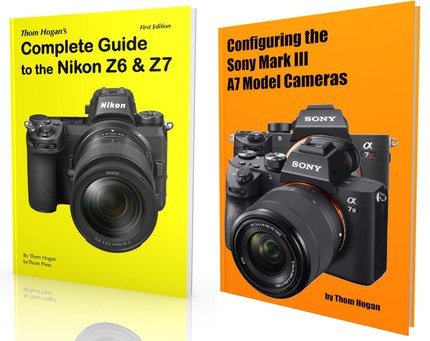 Nikon's mirrorless priorities got switched back in the 2016/2017, which led to a different 2018/2019 product set than originally planned. There's room for two possible approaches for Nikon: a super low-cost approach at the bottom (think D3500 replacement) that tries to compete with EOS M), and making a D6 clone as mirrorless DX to replace the D500. That's about it. But in both cases, Nikon's got profit margin issues they'd have to deal with given their current management. It may be awhile before we see what they really decide to do. Olympus — Already hurting in terms of unit volume, the small size of the RP also adds some blunting to Olympus' established niche, particularly if Canon ever gets round to producing the pancake lenses in RF form. As I stated earlier, the 12-200mm lens Olympus introduced was much more important to their future than the E-M1X. The problem is that they don't really have the body to go with it at the moment. Plus the Olympus body+lens price is likely to be more than the RP with the upcoming 24-240mm kit lens. What Olympus really needs? E-M10m4 with new sensor and E-M1 abilities, coupled with a new 12-35mm f/4 lens that's really compact. Everything bigger than that starts to become just too close to the rest of the pack as they downsize. Panasonic — The S1 series gives them a full frame entry, but they were already at the top of the pricing there and Canon's RP price makes that look far, far away. Still, while Panasonic may not be in perfect shape, they very well could bracket where Canon is right now (e.g. GX10 type cameras at the bottom, S1 cameras at the top). Pentax — This is where being late with no volume hurts you: the Canon RP just put a nail in any mirrorless ambitions you might have had. Sony — Sony is the only company that right now is competitive with Canon, though in some strange ways. The older models are what Sony will point to in terms of full frame entry price. And the older models are what Sony will point to in terms of crop sensor viability. Long term, though, they need a better response than that. The rumored A7000 would definitely be an interesting product, basically doing what I suggest above (all the top full frame features, but with a smaller sensor and price). Such a product would pose a real problem to Fujifilm (X-T3), Nikon (D500), and Canon (7Dm2). Priced aggressively, it would be interesting to see how many would opt for the stripper Canon RP or the top-end Sony A7000. That would tell us something about the remaining camera buyer market, actually.